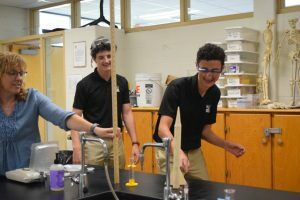 Mrs. Smith’s AP Chem Lab class launched the year with an experiment measuring chemical reactions. 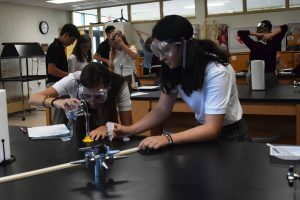 The students used the reaction created when baking soda is mixed with vinegar in a film canister to propel the rockets they had created out of manila folders. Their rockets varied in size and structure. 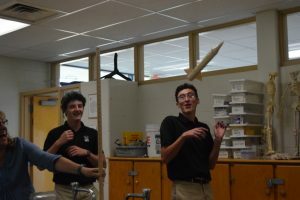 The students’ goal was to see if they could get a rocket to take off one meter off the ground, and they had a little fun while doing it! 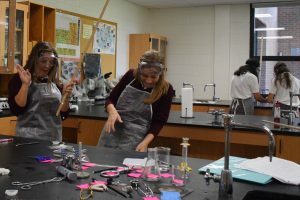 Mrs. Smith said it was one of the most entertaining labs she has ever done with a class.